and not even my 560mm lens could capture a really good shot. 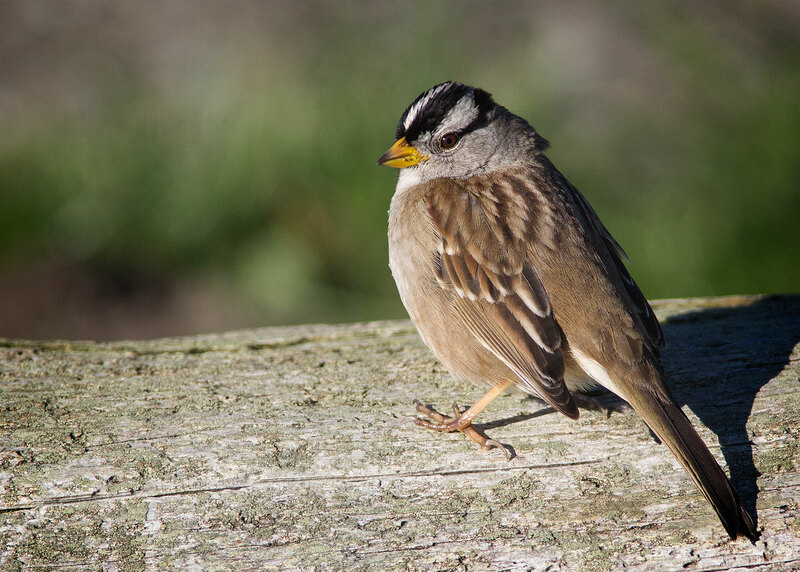 In fact, the only closeup I got at Flagler was of this White-Crowned Sparrow. 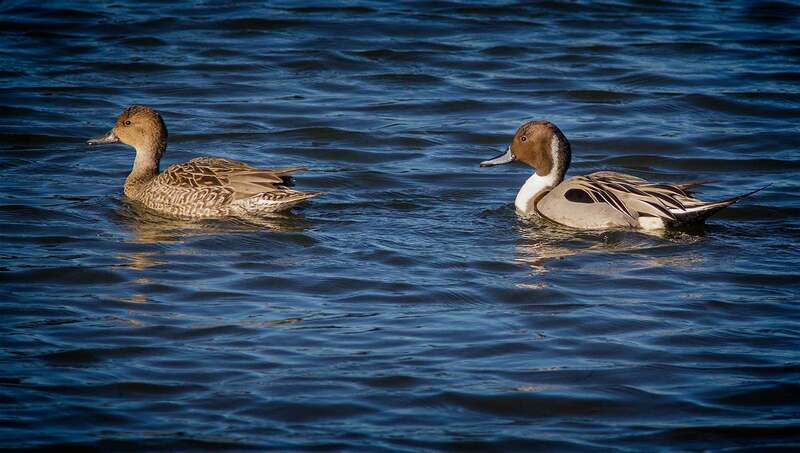 looking much dapper in full sunshine than they do when I see them in the morning fog at Theler Wetlands. 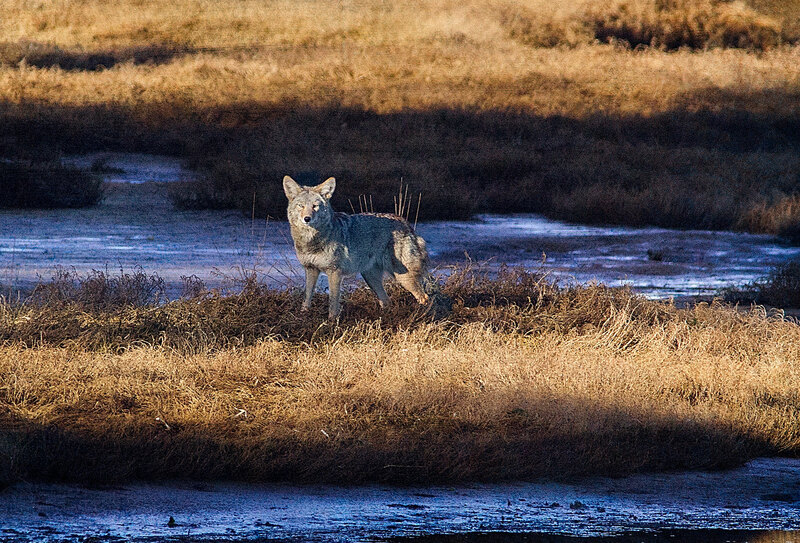 My favorite shot of the day, though, was this shot of a coyote that Leslie sighted as we drove past the wetlands. For a moment, he seemed as interested in us as we were in him, stopping to look at us when I stepped out of the car to get a photo. I would have made the long drive just for this shot. Perhaps this damned cold/virus has finally taken its toil, but I no longer seem to have the strength to resist the Dark Side. The unrelenting clouds and rain certainly provide ample excuse for finally giving in. For whatever reason, I’ve begun playing Dragon Age Inquisition on Windows using an XBox 360 controller, something I’ve resisted for years despite my long love-affair with computer games. I’ll admit to loving Dragon Age because it was one of the few best-selling computer games to come out for the Mac in recent years. I waited anxiously for nearly three years for the third edition to come out, only to learn that there isn’t a Mac version yet, and might well never be. I was pissed, but my addiction to the game made me look at the possibility of finally installing Bootcamp and Windows on my new Mac Pro. After finally getting Windows up and running, Leslie bought me Dragon Age Inquisition for my 73rd birthday. After Tyson and his family left for Colorado, I installed the game, only to discover that it was nearly impossible to play using just the keyboard. Nope, it required a XBox controller, another device I’ve studiously avoided after a few initial attempts to learn how to use one. Learning how to use the controller was, indeed, a painful experience. I’m embarrassed to admit that I couldn’t even figure out the symbols used in the Dragon Age manual well enough to know which joystick/lever to perform basic actions, much less know which of the several buttons/triggers to use to access menus or actions. I died so many times when I began playing the game that I thought the game should have been called Groundhog Day. Given enough practice, though, I did manage to learn how to nearly walk/run in a straight line and attack easy monsters using the controller. The last few days I’ve found reasons not to go to bed at the normal time, not to get up at normal times, and not to go birding or to the gym. I knew long ago that I’m a compulsive gamer. Once I start playing, I find it nearly impossible to stop playing, not to let the game take over my life. So, if you don’t see any posts here for a while you can blame it on Dragon Age — or the rain descending upon us. Hopefully I’ll have defeated all the monsters and saved the world by Superbowl Sunday so that I can get back to an even older addiction. I spent the second half of Monday at Port Orchard, though there seemed to be a few less birds in the Marina than usual, perhaps because there was another photographer wandering the area. I did manage to get close to a couple of birds, though. 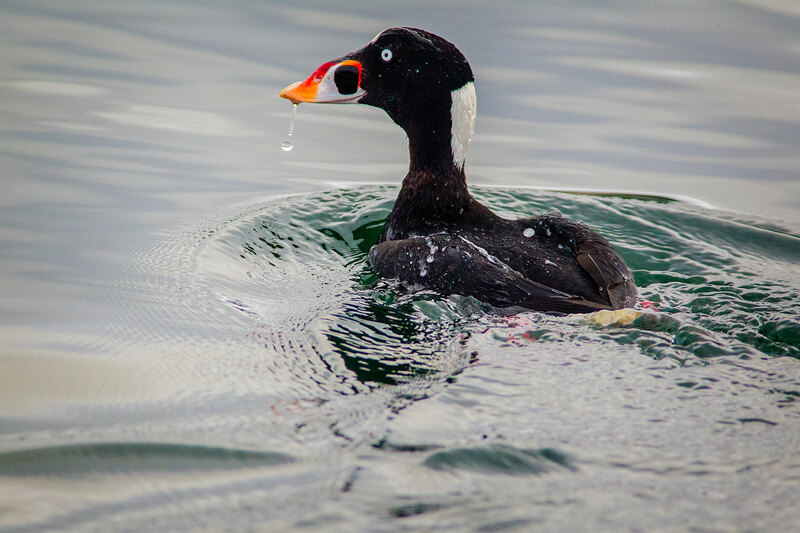 Surf Scoter usually paddle away before you can get close enough to get a good shot, but this one actually popped out from under the dock just as I walked by. Of course, it was so eager to get away that there is no way I was going to get a shot of anything but its back. 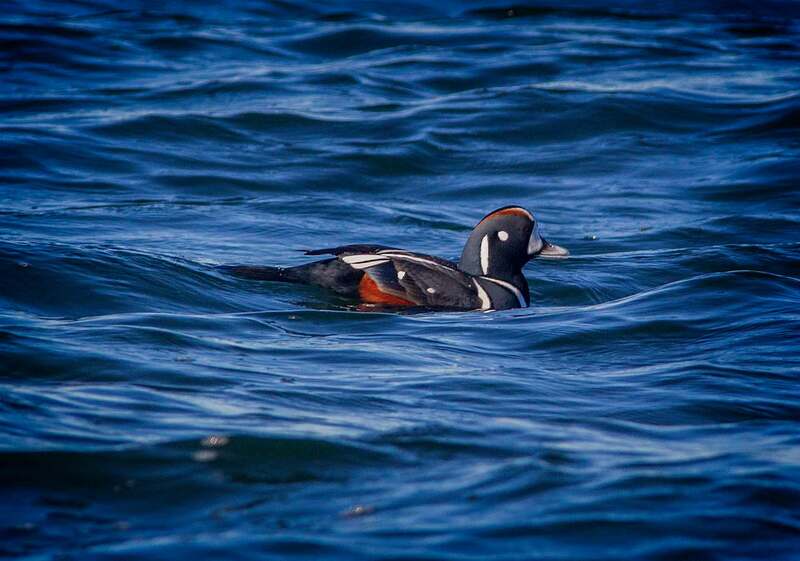 Still it’s hard to miss its distinguishing marks: the brightly colored beak, the “wiggle” eye that looks like it belongs on a doll, and the white patch behind the neck. darting from one end of the marina to the other, only to repeat the pattern as I approached the end of the dock. I probably spent the most time, though, capturing a shot of this little bird, fascinated because I couldn’t identify it at first. 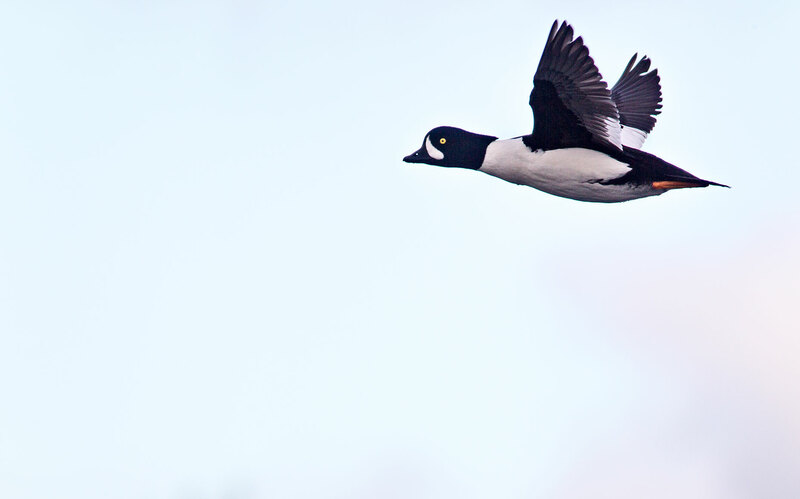 At first it kept fleeing down the boardwalk, running slowly, then flying a short distance before landing. After I neared the end of the dock and turned around because I didn’t want to totally stress it out, it flew past me as I walked back to the marina entrance. At one point it even seemed to chide me. 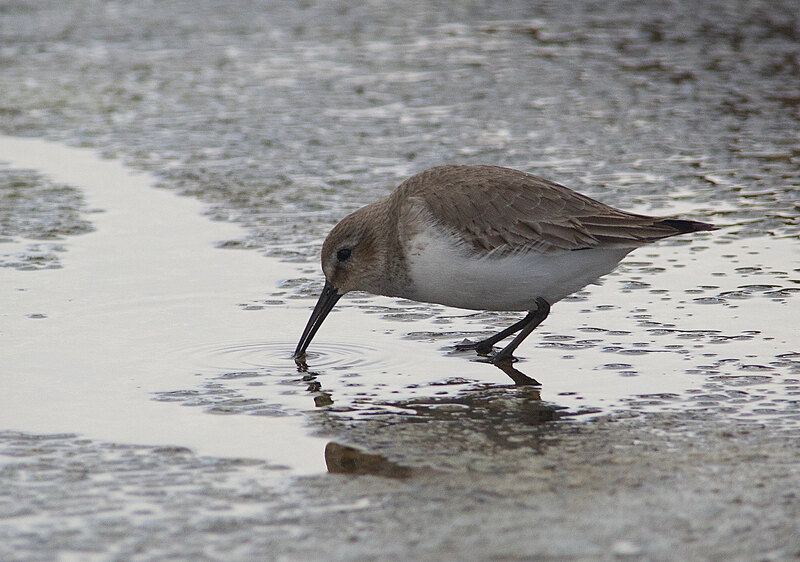 This all seemed like rather strange behavior for a shorebird, especially when I finally decided that it must be a Dunlin in non-breeding colors. 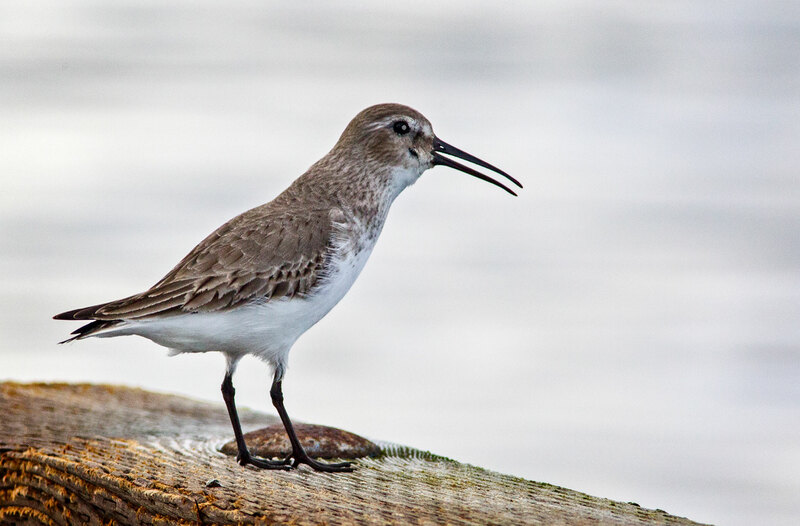 I’ve photographed lots of Dunlins, but usually in breeding colors and almost invariably in large flocks on the beach, not a solitary bird walking a marina. With rain again predicted for most of the week, I spent Monday at Theler Wetlands and Port Orchard. There were a lot of birds, but mostly the usual suspects, Great Blue Herons and ducks. 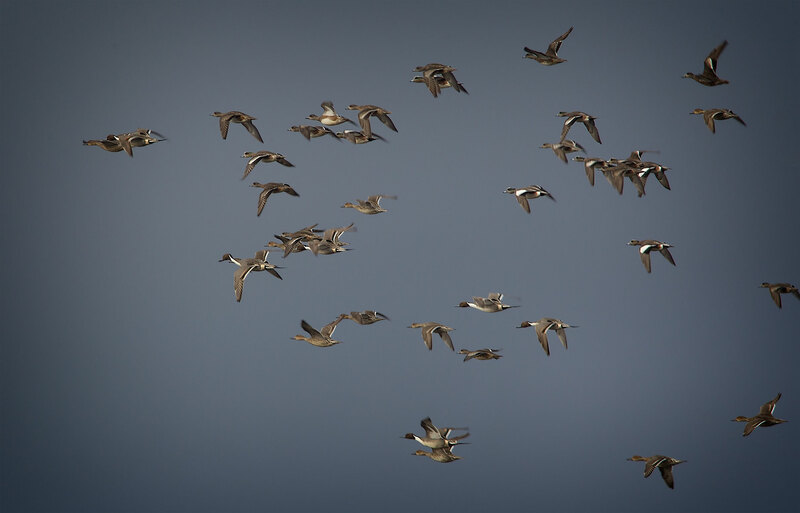 Large flocks of Widgeons and Northern Pintails rose up from the wetlands and moved to new feeding areas. 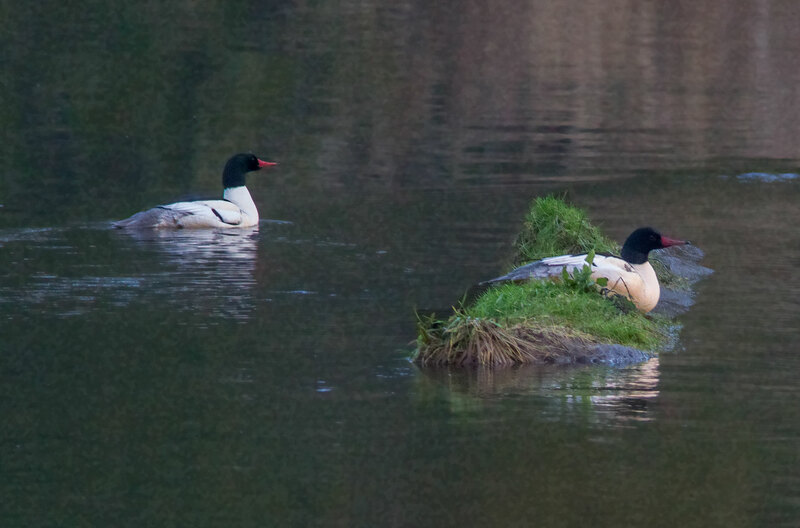 About the only unusual birds I saw were a pair of male Common Mergansers resting in the heavy shade near the end of the trail. I didn’t see much all the way back, either. 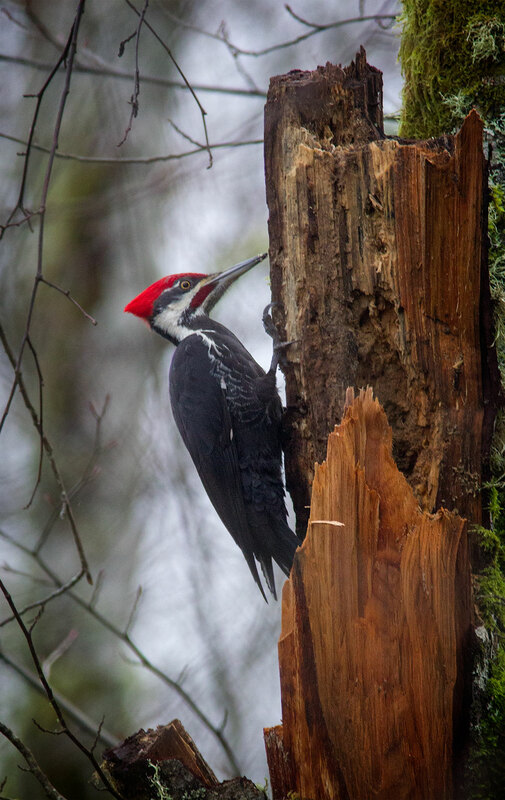 When I heard a Pileated Woodpecker’s cry, I immediately thought of Ruth Sullivan’s saying when I started birding, “ All we need is one Good Bird.” Since I have often heard this particular woodpecker at Theler but very seldom see it, I didn’t really expect to see it. I should have been more ready, because not long after I saw the bird right next to the trail. Of course, by the time I pointed my camera at it, it had moved further away. Still, considering the lack of light, I was quite pleased with this shot, certainly one of the best I’ve gotten in years. I had my “one good bird” and was ready to head to Port Orchard. Fortunately, though, I ran into John after missing him at the Salmon Center. We talked awhile and I thought I’d walk part way back with him before heading out. 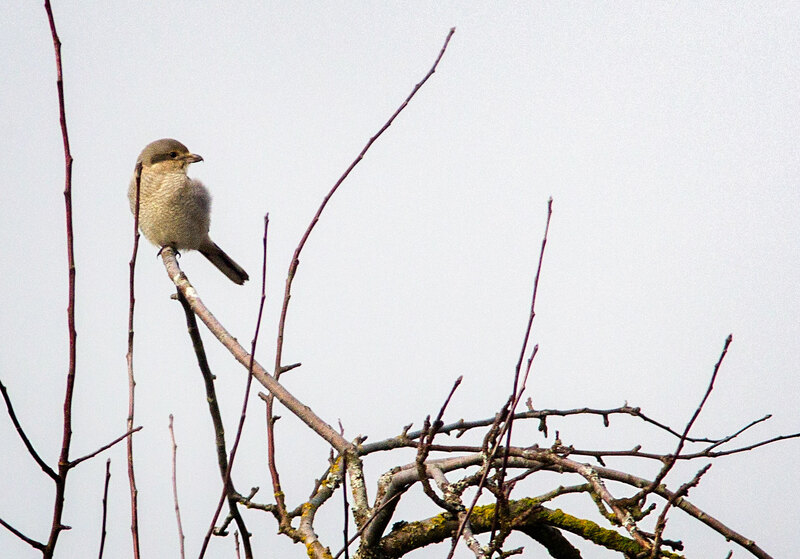 We hadn’t gone very far when he spotted a Northern Shrike at the top of a tree near the pond. It’s even rarer than the Pileated Woodpecker around here; so I actually ended up with “two good birds” for the morning.